Kalvos & Damian’s New Music Bazaar, Shows #258/259, 29 April and 6 May 2000. Kalvos & Damian on the road in New York in the composer’s home. Listen to the interview (RealAudio) from the original broadcast: Audio Part 1 [0:30:02–1:27:42] / Audio Part 2 [0:30:01–1:30:13]. 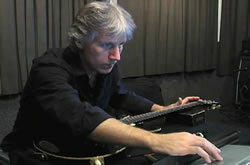 With a musical career spanning 25 years, Nick Didkovsky is a guitarist, composer, and music software programmer. He founded the rock band Doctor Nerve in 1983 and was a member of the Fred Frith Guitar Quartet during its ten-year tenure, contributing 12 pieces to the quartet. He has composed for Bang On A Can All-Stars, Meridian Arts Ensemble, ETHEL, Loadbang, ARTE Quartett, and others. His compositions and guitar work appear on over 50 records. With computer music pioneer Phil Burk, Didkovsky created the music programming language Java Music Specification Language (JMSL), which is used by composers all over the world. He has taught JMSL at Dartmouth College, CalArts, Columbia University, and New York University. His Black Sabbath Guitar Lessons on YouTube have been received with great enthusiasm by metal fans all over the world and his metal band Häßliche Luftmasken had its premiere performance in June 2011. We listen to Flykiller by Nick Didkovsky [0:30:02–0:31:52]. Performed by Nick Didkovsky. Published on New York Guitars [CRI CD 698]. [Nick Didkovsky] And you wonder why we starve. [Kalvos] I have no idea why we starve. [Damian] Finally after illnesses and misdirection of interviews and such, we finally can put things right because the Doctor is here to prescribe the proper medical music for us. [K] What do you think that would be? What would be proper in any way, shape or form for us? [D] I haven’t the faintest, but I’m hoping he’ll tell us, play something for us… or hack at us. [K] Our guest is the Doctor, Nick Didkovsky, back at Kalvos & Damian after four years. And of course a brief appearance, not only through his music on a regular basis, but at the Amsterdam event. [ND] Oh yeah, that was a great event. [K] Hi Doc! How’s it going? What have you been doing for four years? [ND] Hey, how’s it going? I’ve been coughing for four days. [K] You left us with this promise, four years ago, of a string quartet and Doctor Nerve piece. [ND] I just finished the mix of that. I brought a little of it to listen to. I just heard from the mastering people yesterday, they received the tapes, they are digitizing them and they’re going to send them back to me. I will be assembling the 24-bit files, creating the final “Frankenstein” and sending it out. It’ll be out in the Spring. It’s been intense, it’s been incredible, it has made it its business to push as many boundaries as I am personally capable. Not the least of which was musical. The music was at least rehearsable, but everything else is just insane. [K] Do you want to tell us about that history first, or should we go on to something else and come back to it, it’s kind of a painful thing. [ND] After the first basic tracks session which was in July, difficult enough to get together with as many people as were scheduled. [D] How many were there? [ND] As few as was functionally necessary, put it that way. Anyone who had a solo which would affect the duration of the vamp underneath it. Whatever was happening obviously had to be there. So we wouldn’t throw some stilted solo onto one-and-a-half minutes of vamp where the guy wasn’t there. [K] Well, let’s go back and tell [the listeners] what we’re talking about. [ND] We’re talking about a piece called Ereia, which I composed for Doctor Nerve and Sirius String Quartet. [K] Which we heard little snippets of, your first sketches of, when we talked to you four years ago. [ND] You heard the computer versions, yeah. [K] Right, and you had gotten up to a bassoon solo or something, that was going to be some other sort of a solo, eventually ended up maybe in the viola. [K] Did you quit your job? [ND] Didn’t you know about that? I quit teaching high school many years ago. Things got pretty nasty over there. [K] You didn’t ever tell us this. [ND] What? Oh, well we only interview each other and I keep it out of the email so that I can get reactions like I just got from you. [K] You don’t get accused of being an academic for high school, we don’t rag on people for teaching high school. [ND] Yes, that was Leo. [K] And you were going to have pasta that night, penne with tomato sauce. [D] And now you’re thinking of going back and teaching high school again? Nick Didkovsky and Sirius String Quartet in concert at ISSUE Project Room, 6 January 2007. L to R: Gregor Huebner, Rachel Golub, Dave Eggar, Ron Lawrence, Nick Didkovsky. Photo © Scott Friedlander. [ND] No, not even close. As would be expected when you are not looking for work, that is when work comes to you. Just by being out in the world. I highly counsel anyone who is listening to this to just quit a bad job, get out of it now and just trust your future a little bit. Because just by being available to serendipitously run into people you come up with some pretty amazing things. I actually found my new job by being in the magazine shop at the right time buying this unbelievably nerdy magazine called Unix Review or something like that. I put this really [geeky], heavy magazine on the counter and this woman next to me says, “Oh, do you do that?” I turned around and said, “Well, as much as I need to, I just quit a job teaching.” She got really excited, it turned out she was the head of this neurobiology lab that had a ton of Unix machines and none of them knew how to use them. She said, “We need someone to come in and read our manuals and just teach us how to use our equipment. Are you interested?” “Yeah, of course.” “What’s your rate?” Three weeks later she called me up on her promise and I went down and had a great day visiting everyone there and started a freelance job. Things worked out. These are the kinds of events that transpired during the evolution of Ereia. [K] Let’s hear to a tune now, since we’ve been listening to the talk. Who knows what it’s going to be, do you want to choose something or should we just choose something that exists? [ND] I would suggest playing this excerpt from the current sessions, this is from The Thorn Piercing His Coat, it is the big melody at measure 50 followed by Todd Reynolds’ violin solo, followed by my guitar solo, followed by the outro from it. We listen to Thorn Solos by Nick Didkovsky [0:39:56–0:44:15]. Performed by Doctor Nerve and Sirius String Quartet. Recording provided by the composer. [D] I like that, it has a macho feel to it, a sado-masochistic feel. [ND] There’s a lot of those images in Ereia, there’s another movement called He shares a Little Knife with his Sister, there’s another angst-ridden one called Far Away Scares Him. And the final movement is called At Last the Hand, Shifting, which almost sounds like kind of a [incomprehensible] vibe to it. A lot of these titles came from Markov permutations of some of the prose and poetry that I or members of my band wrote. Thorn I think originated from this story I wrote, it’s actually one of the Nerve stories. [ND] Absolutely. Skin is not only the name of the CD, but the name of the story. What a Markov process is, it’s been around for quite a long time. It is a way of mapping the probability that one event will follow another event. A coin flip would not be suitable for a Markov process because whether you flip a coin and you get a head this time has nothing to do with whether you got a head or a tail last time. There is no utility in figuring out whether a head is more likely to be followed by a head, or more likely to be followed by a tail. In the case of, let’s say, simulating weather, where you’re doing some kind of computer simulation game or something like that, where rain is likely to be followed by rain the next day with let’s say an 80% chance if you’re in the rain forest. So if it’s raining now there is an 80% chance that it is going to be raining tomorrow, or a 20% chance that it is going to be sunny tomorrow. Given a sunny day, it may be a 50-50 coin flip whether it’s sunny the next day or rainy the next day. That’s called a Markov process. [K] And you can do this kind of analysis in all sorts of ways. I was working on a piece in ’91–92 called Drip Works. It was based on the ten pitches that a dripping faucet happened to be producing one night. I wrote them down, they weren’t patterned, but certain probabilities were higher. I wrote down hundreds of them and did a Markov analysis to produce pitch streams for a composition. That was one example of one of the ways that I used it. The piece had a great name, it had forty great pages but I hated it by the end of that. [ND] Because you did that by hand, didn’t you? [K] Actually the Markov analysis I did on Clarence Barlow’s machine, [A Kalvos & Damian interview with Clarence Barlow is published in eContact! 12.2] but the actual composition I did by hand. [ND] That’s a bit [incomprehensible]. Can you listen to it to this day? [ND] Amazing, that’s a great idea. English sentences, sentences in any language, the word “the” is likely to be followed by a noun: the boy and the dog. In that sentence, “boy” follows “the” 50% of the time and “dog” follows “the” 50% of the time. The word “and” never follows the word “the”. If you apply a Markov process to analyse those transitions in that sentence and then start rolling dice and generating statistically similar stuff, you would get things that sounded sort of like the original source material. You would not get syntactically incorrect word pairs, you wouldn’t get “the and”, “and and”, “the the the and”. It’s not just picking a number out of a hat, it’s [about] transitions. So that gives you some pretty bizarre sentences, it gives you some very poetically beautiful twists of phrases and flavoured turns of a word. It’s a wonderful process to apply to language, it’s a wonderful process to apply to arbitrary events that are then mapped to music. You can also apply them to pitches, durations, combinations of pitches and duration, as was done in the 50s with Stephen Foster’s music, when Markov processes first wormed their way into computer music. I don’t use it to try to duplicate or catch the flavour of anything, I think that’s the wrong way to do it. You’re looking at such a small window of significance. If you write a melody that is 25 notes long, what am I really going to learn about it by seeing what the likelihood was of a C-sharp to follow a D? You’re not thinking two notes at a time and I’m not hearing two notes at a time; we’re hearing on a much larger scale. So the idea of capturing a style through a Markov process is theoretically probably erroneous. But! If you don’t care, it generates pretty cool stuff. And being someone who doesn’t particularly care, I get a lot of cool stuff out of Markov processes. [General laughter] Like The Thorn Piercing His Coat, for example. [K] Should we read this text? [ND] I would love to hear a professional read this text! [D] “It wasn’t so much the sensation of the thorn piercing his thumb as the idea that bothered him. A rose was a gift of love, after all, and he was too much the realist to go for that 19th century ‘love hurts’ sort of thing. His mind rejected the metaphors invoked by thorns and roses with the vehemence of vomit. His thumb bled not because it was punctured by an errant arrow fired by a drunken cupid. Rather it bled with clinical correctness, fortifying, not eroding, his Weltanschauung. “‘Amalia, I love you,’ he spoke out loud and drove a thorn deeply into his index finger. He was daring himself with love and thorns, as an uneasy glutton might dare himself to stand before a pastry platter. “‘I love you, Amalia, more than the sun, the sky and the sea.’ He used each subject of his invocation to puncture another blood-letting wound. His hand was getting messy and the flower vendor was shifting from leg to leg nervously, like a circus bear waiting for its unicycle. “‘Will the gentleman be buying roses today?’ the bear offered in a voice that cracked, just a little. We listen to Little Johnny Stinkypants by Nick Didkovsky [0:52:21–0:59:10]. Performed by Doctor Nerve. Published on Skin [Cuneiform CD RUNE 70]. [D] That’s incredible, that’s just astounding. We have an historical imperative from, Rando’s Poetic License. [K] Yes, a piece that I wrote in 1978, in which I took the rhythm and syntax of the kind of poetry that I wrote and created a programme to produce reams of it, literally. We did a piece for the Washington Project for the Arts in 1978, with a microcomputer generating this poetry based on input from the audience during the course of the performance. The poetry was scrolling by on the screen scattered through the audience and they were whispering it as new vocabulary that was being input and other music was happening at the same time. It was one of the earliest interactive micro-computer pieces ever done. It was done on a Model 1 TRS-80, before they were called the Model 1 in 1978. [K] It used the principal of analysing a syntactical structure and style, by hand again, and then reproducing that by programming it. It was so exciting. So you see, Ve hav somezing in common, Doctor, ve hav somezing in common! [ND] So, my friends, what’s next? Shall I play you a little computer music? I’ve been working on a new music technology called JMSL, which is the inheritor of HMSL, “J” standing for Java. [K] A musical specification language. [ND] Yes, HMSL is the Hierarchical Music Specification Language built by Larry Polansky, Phil Burk and David Rosenboom when they were all out at Mills. It still functions, and it is still running on my Amiga on my desk. I’m not sure how long my Amiga’s going to be running. So a few years ago I had sort of a panic, I looked back on ten years of work all dedicated to a hardware platform that has long been orphaned. [K] It’s orphaned and now the parts are slowly dying, the monitors are slowly dying. We have another friend who works on those and lost the monitor and finally had to move everything as best as she could. [ND] I’ve got a lot of very personalized software tools for composition that I wrote on the Amiga on HMSL. So it’s a scary moment to think about how much more I want to invest in it. Right about the same time, I became very interested in the Java programming language, which, for all its hype, one of the things that it does live up to is that it does cross-platforms pretty well. [K] It’s portable, and this is a great thing because of what you were working on that I tried out many miles away. [ND] Which actually didn’t work pretty good at first. It gets into this whole thing of whose bug is this? Which version of Java is it? Is it the programme’s bug, is it Netscape? Is it the version of Netscape, operating system, amount of RAM, processor? Life was easier on the Amiga but I can’t live in that world for too much longer comfortably. Java looked really interesting to me, I wanted to see if I could at least port the essential ideas from HMSL to Java and see if Java was as a) able to do something as simple as send out a MIDI note; b) stay on schedule; c) have some of that nice, hierarchical functionality and scheduling that was built into HMSL working under Java. [K] Let’s back up real quick and give the two-minute précis of what a music specification really is. It’s such a general notion that this idea of a shape does not have an inherent meaning in HMSL, it’s the programmer’s job to give it a meaning. [ND] HMSL is an experimental music composition tool kit, really, written in a language called FORTH. It runs on the Amiga and it runs on the Mac. It’s not like a sequencer that you pull off the shelf, and you can plug in and start recording your music. You actually have to write programme code to listen to anything. One of the things it can do, the central paradigm of HMSL is this generalized data structure called “shape”, which is what it sounds like. It’s an ordered list of data points. If you would look at it on the screen, it would look like mountains and valleys. It’s such a general notion that this idea of a shape does not have an inherent meaning in HMSL, it’s the programmer’s job to give it a meaning. So if you want those mountains and valleys and cliffs and contours to represent pitch, you write an instrument interpreter that reads that shape and interprets it as this pitch, any kind of pitch: a MIDI pitch or frequency in Hertz. Similarly, you could have a shape be interpreted in a much more indirect way, rather than every data point being a deliberately, obviously sonified event (like a loudness or a pitch or a duration), it could be a seed to a random process or a chaotic process or a deterministic process. Or any algorithm that you want to write. HMSL is this general kind of sandbox for algorithmic music composition. You come up with an idea, and if your hardware can physically deliver the hardware specifications of your idea and if you have the imagination and the programming chops to realize the creative idea that you’ve got, then it will deliver. As opposed to very interesting programmes like “M”, which are automatic composition tools, but they are what they are: if you don’t like what they do, that’s it. You can’t open M and change it. [K] HMSL was written for just two platforms, as I recall, for the Amiga and for the Macintosh. In order to gain the portability and give longer life to your own ideas, you figured why not just go for a portable language as much as possible. [ND] A portable version of it, yeah. So as a kind of test flight, I ported the minimum structures that I needed from HMSL over to Java. I was running up against a deadline for Schubertiade. [K] We played Franz in the Underworld, which is Phil Kline’s piece [see interview in eContact! 10.2], we played your Schubert’s Impromptu in E-flat two or three times. [ND] Here I could do a very short version and talk over some of the parameter changes I am doing in real-time, which is kind of a fun thing. What you are going to hear is a statistical reconstruction of a performance of Schubert’s Impromptu. The live performer was Evelyn Luest. Evelyn is a magnificent performer who I met over this piece, because she was actually preparing it for a live performance. She had MIDI keyboard, so she could perform it and send the MIDI data out to my computer, where I could capture it. I’ve got a performance of hers on disk, in note-loudness-duration format. What my software will do, is it runs through her performance first and it generates twelve statistics ten times a second that effectively model the various behaviours of what she is doing: the average pitch; the average loudness; if there’s a chord; how harmonically complex it is; how dense she’s playing or how non-densely she’s playing. There are twelve of these statistics and they just rip by ten times a second. If I just play it back from those statistics, you’ll kind of hear the original. It will sound like a stuttery version of the original but you’ll definitely recognize it as the original. But I’ve also got a graphic user interface that allows me to specify my own parameters for each of these statistics. And then there is one slider at the bottom that morphs between the originals and mine. I can start the piece for you and make some of these changes, describe what I’m doing as I’m doing them. We listen to a commented performance of A: L:ittle J:MSL C:omputer M:usic by Nick Didkovsky [1:07:10 (description) and 1:09:13–1:13:18]. Live performance by the composer. [ND] What I never get to do is push those boundaries as hard as that, it’s fun to do that. We have the sort of elegant version on CD already, but here it’s nice to push the event density to something that might actually make the MIDI output choke a little bit. We heard at one point that it was clicking a lot, it was just flooded with these giant chords, thirty events per second getting blasted out. It could not keep up. [D] Do you always use a laptop or do you ever use a regular machine with a mouse? [ND] When I premiered this piece I didn’t have a laptop yet. Technically, it was a nightmare. You had to back up to a tower PC, a big monitor. The smallest thing was the piano MIDI module. It just seemed so ironic that there is technology out there that is as small as a laptop and I’m still lugging this PC around. The whole piece fits in a bag now, which is kind of nice. [ND] Thanks. It’s going to be performed by the newEar ensemble in Kansas City. It’s the first computer music piece of mine that is going to be performed with me not there. [It’s going to be performed] on a laptop, with Java, with this programme that I emailed to them. [ND] No, with a piano module but a live performer interacting through it. I’m very interested in that process, because computer music can become an extremely private experience, where you write the software yourself, you know what it does. There aren’t that many surprises, and the depth and the intimacy with which you understand the logic underneath it is pretty deep and rich. To hand that to somebody else is a scary thing. You become very familiar with your own software, so to hand that to somebody else, it is very brave, on their part, to take on, because they didn’t share the weeks and weeks of hacking that you did. They’ve got to come up to speed with this thing and it’s got to be obvious right away. [K] To an audience as well, what’s going on. Because audiences have endured the idea of a pair of speakers and nothing happening. Only recently has it been clearer that there is interaction going on. We saw a concert at Dartmouth not long ago, where there was an awful lot of “two speakers sitting there” and people nodding off. But there were a couple of interactive pieces where you could see what was going on. Even though it was a pair of laptops, there was obviously a physical action happening, so it became almost the same as with a piano and somebody pushing this 19th-century mechanical thing, the same kind of emotional and intellectual interaction going on as with an electronic keyboard. [D] But this also sounds like something that a modern dancer would kill for. It would be so much fun to interact with this, particularly if a dancer did know precisely where it was going. I would think this would be in high demand. [ND] Yes. Well, I’m looking forward to this first experiment to see how a non-technical person, who is an excellent musician, can grok it or not, can understand what these faders are really doing. It’s the first independent distribution of a JMSL piece, I’m really curious to see what happens. It should be pretty cool. Pat, at newEar, has informed me that the performer is a nun, which is just so amazing. I don’t even know why it is so amazing, it just makes people laugh. I got this email from her: “Oh you’re going to love this, the woman who is performing your piece is a nun.” Great! Well, good luck anyways. [K] What’s going on with Doctor Nerve? We’ve heard you with Kathleen Supové in the group, is she still with you? Has it changed the dynamic? [ND] She’s a lot of fun and the dynamic is pretty extraordinary. We’ve had our most high-spirited, total blast of a tour after she joined the band. We were in Europe for three weeks last year and it was just extraordinary. [ND] I can imagine the analogy. Yeah she does fit in, she’s just incredible. She’s an amazing reader, first of all, she’s a very interesting improviser and the group spirit, the vibe that she brings to an ensemble is just incredible. Plus it’s really great to have a woman back in the band. Doctor Nerve originally had two women in the group, Anne Brudevold and Ann Sheldon on violin and cello, respectively. There is definitely a different vibe to a mixed gender ensemble than there is to a single gender ensemble. It’s been years since Doctor Nerve has had a woman in the band. It feels really good. The addition of Kathy to the ensemble has had effects in many different spheres. Not just musical, but in spirit, too. The band feels better now than it has in a long time. [K] How long have you been together? [ND] You know, we tried to figure out what the official beginning was, but it’s something like fifteen years now, maybe more. It’s unbelievable. Yves Duboin has been in it the longest, besides myself. Michael Lytle after that. The “new guy” Rob Henke has been in the band now for years, but he’s always been thought of as the “new guy” since he joined, before Dave Douglas left (they overlapped for quite a while). [K] This is not your everyday rock and roll band, either. We listen to Plague by Nick Didkovsky [1:21:37–1:24:38]. Performed by Doctor Nerve. Published on Skin [Cuneiform CD RUNE 70]. [K] This piece is so intense, all the pieces by Doctor Nerve are so intense. How do you do that, how do you maintain? [ND] That’s an interesting… I don’t really know. Plague is kind of a unique one, it’s like this piece that only survives in virtue of it being this meteoric burnout. It doesn’t develop, it sort of goes somewhere, but not in any strict compositional sense of form developing. It just keep on [makes fiery meteor sound], and as long as it keeps on heading toward Earth, it’s working. That’s the best way can describe it. It’s odd, because this is a piece that didn’t come out of any kind of a jam, it was written in the old-fashioned way (or the new-fashioned way, or whatever you want to call it): punching notes into a staff on a computer. Composing it, I’m listening to it in a pretty sterile synthesis environment. It’s actually good, if that gets my blood going, if I can get excited by that, I know I’m on to something. I remember recording Plague, I remember the experience really well. It began with two riffs that I came up with on guitar (which is buried in a manuscript book somewhere) and I put them together, and the piece just kept unfolding itself, pretty much linearly. I wrote it front to back, chronologically, which is kind of unusual. [D] How much of the music is finished before you give it to the band? How much development occurs once the band member has it? [ND] Good question, honestly it’s done, by the time I get it to the band, it’s done. There has been some feedback, where certain things just sound a little funny. It kind of relates to this Kathy issue. Suddenly there is a piano playing instead of a vibraphone, suddenly it’s rooted down with the guitar and the bass instead of sparkling over the top with percussion and suddenly something doesn’t sound right any more. Then, I’ll change it, but typically things do not change much from the time that I hand [the music] to them. Except in the philosophically broadest sense, it changes completely in virtue of the fact that they are playing it. Or when someone does a solo over a passage. You want change? Get Michael Lytle to blow a solo all over it! [Laughter] Any part of music, it’s going to transform it dramatically. We listen to Impromptu in Eb Major by Nick Didkovsky [0:30:01–0:34:40]. Published on The Alternative Schubertiade [CRI CD 809]. [K] Let’s hear about some pieces you’re working on now, and if you can weave into that how you start a piece, and if they are written for venues. Because you are in a lot of places. [ND] Let me talk about two pieces that I’m working on now, and some of what I’m going to say is speculative. [K] We won’t hold you to it… until years from now. [ND] I’m working on a piece for the Meridian Arts Ensemble and given the way my life has been, which has been, time-wise, catch as catch can, since Leo was born and since my second son Sasha was born. I find that my time for composing has been these concentrated blasts of a few hours here, separated by days and then a few hours here… It’s just the nature of being a new father and changing jobs and living in New York with two kids. So I adapted my idea for the Meridian Arts Ensemble. Instead of it being this big, cohesive, non-stop twenty-minute piece, which by the way they discouraged (which kind of gave me the idea), they said, “The last thing you need is another 20th-century big piece that we can only programme three times before it takes up too much space on our programme, and there’s other things to do.” That, along with this fractured attention that I described which is inhabiting my life right now, I decided I’m going to write a lot of miniatures, 45-second pieces, 2-minute pieces, things that I can conceive of in this guerrilla speed. Here’s an idea for a piece, let’s get it down! It’s two minutes long and it works, and it’s really cool. Or it’s 45 seconds long and it has a beginning, a middle and an end, it’s got a place for a solo, it’s got this little dribbling out end, but that’s really cool. Pieces that, metaphorically, fit on these cards, so you can shuffle through the deck and say, “Hey guys, you want to do 34 today?” Clearly that’s an adaptation to my life. But also I think it is going to be very well adapted to their programming. It reminds me of what they said about the first Ramones record. Every tune was thirty seconds or a minute or two minutes long. When the guy went for a station break there was always enough time to throw on a Ramones tune. [ND] A marketing gimmick, indeed, exactly. Nick Didkovsky sells out by writing short tunes! I decided I’m going to write a lot of miniatures, 45-second pieces, 2-minute pieces, things that I can conceive of in this guerrilla speed. [ND] I know, it is a radical departure. So here is going to be a big bag of short tunes. And hopefully they are going to fall in love with a few of them. You can pull out a couple for an encore, you can put one at the beginning of a programme, two in the middle, three at the end. I didn’t want to build another big Golem that inhabits the concert space, “You must play me for twenty minutes or you may not play any of me.” Forget it. You want to play 45 seconds of my music? Here it is, here is a piece. I’m using my software again to generate raw materials. I’ll run it a couple of times, if something catches me, I’ll save it to disk and develop it. I’m also walking around with a notebook and thinking of ideas that have less to do with specific pitches or durations or forms, sort of higher level abstract forms. I’ve got this idea for a piece called Tic, which I may never actually do. It’s built around this idea of a unique nervous tic that you might have that might be somehow sonified. It’s theatrically amazing to see five people on the stage, [you wonder] did the piece really begin? But some guy is going [demonstrates sonification of tic] the same sound every time, maybe morphing that or turn that into your instrument, or cross-fade or develop that into an improv. This is an idea that I may not even use, but it’s the kind of idea you’re walking around thinking what’s the highest level, roughest level behaviour that I would like to see in a piece? I’d like to see some guys perform off of nervous tics. You shelf it and you use it or you don’t use it. There is a wide variety of influences. I haven’t actually picked up my guitar and played a melody that would end up being in one of their pieces. There is one real heavy riffed-out metal tune that is a minute-and-a-half that I wrote for them that does have its origins in guitar. But I want to keep the influences a little more abstract for this batch of tunes. I don’t necessarily want them to come out of real instruments, I want them to come out of personal selections from statistical processes, or more abstract ideas that I get and then write them down quickly. I just want to see where those kinds of things go. The other piece I am writing is for Sirius String Quartet. Remember those Heil Talk Boxes that Peter Frampton made you hate? [K] Oh, God, we remember that, this is a sad memory. [ND] Exactly. Well when you think that what one of those Talk Boxes is, it is an amazing real-time filter, using your mouth. You’re more familiar with that instrument [your mouth] than any other instrument, you’ve been using it all your life. You take your signal, you pump it into a little preamp, the preamp amplifies it into a speaker, the speaker sends the sound up the tube, the tube ends up in the performer’s mouth. Unless the performer opens their mouth, the audience doesn’t hear a thing. The performer opens his or her mouth near a regular microphone that goes out to the PA system so you hear the effect of this loudly. So if you would imagine playing guitar into one of these talk boxes and the tube is going through the performer’s mouth, and the performer’s mouth is just miming, shaping some vowel, “wawawawawa”, without actually sounding the words, just opening and closing the mouth, then you are actively filtering the sound of that guitar with your mouth, which is pretty amazing. Unfortunately, the way we all hear it is “Do you feel like I do,” [bragging voice] I can make my guitar talk, isn’t that cool? It’s pretty terrible, but if you think a little more openly about it, imagine a string quartet, each instrument going into one of these things, highly amplified, shaping the dynamics and the audio spectrum of what the string quartet is pumping out in real time with their mouths, there are some psychotic possibilities. It’s also a very difficult piece to compose, because there is no way for me to simulate it. At this point, we haven’t gotten the equipment, so I can sort of speculate what it will sound like, but there are a lot of technical issues. There is going to be a lot of improvising that’s going to have to be done before I can actually start to decide what works or doesn’t work. I actually overestimated the effect that people are hearing the violin off-stage. It’s not an electric instrument like Peter Frampton’s guitar was. You turn the volume off on the guitar, you don’t hear the guitar. The violin cuts [through], you’ve got to hear that. So there are going to be a lot of issues like that that are going to get ironed out. [K] Sure, or maybe unexpected things, like maybe certain mouth filtering things end up doing some amazing harmonic things, you blast out with a harmonic that overwhelms everything else that you were playing before. [ND] Right. So it’s a piece where I want to give the band the opportunity to do a lot of improvisation. It’s a life-long instrument, what a quartet can do with this kind of mouth filtering. There’s also harmonizing pedals and distortion pedals built into the piece. I think it would be a tremendous injustice to freeze everything in a composition and just say, “This is what the work is.” I think it will be more episodic, where they will be totally free improvisation — just this person or this duo, or all of them, or there may be some moments of directed improvisation, like “stick to long vowel sounds but do whatever you want,” or “stick to skittery kinds of things,” these kinds of global instructions. And then there is going to be through-composed stuff, too. I think the toughest thing is going to be to have the through-composed stuff stand up to the accidental stuff that going to happen in the improv, because it’s uncharted. That’s going to be a little dangerous, which is exciting, but it’s definitely going to be a dangerous place to play in. [K] You’re at the nascent stages of this, it’s well into the future? [ND] Well, we want to get it done within a year. [ND] The funding is already in and we’ve done one experimental session, not with the Talk Box but with the harmonizing pedal. It’s very generous to string sounds, this particular pedal that we’re using, it really delivers it quite beautifully. We’re going to be able to do a lot with that. It’ll be more a question of — as usual, I guess this is nothing new — the compositional issue is going to be more a question of limiting my possibilities rather than trying to explore every single one and try and make it into one single piece. [K] I think that it should be done in an airplane. You know, in planes the headphones used to be tubes, they used hollow tubes up to the headphones. You should actually have the string quartet playing in one part of the plane and then using the tubes to filter it so it goes back to all the rest of the plane and that gets to be the entertainment for the flight. You could have some really crazy passages. [D] However it sounds like we have to wait another four years before we get the 21st-century version of Tommy from Doctor Nerve. I was looking forward to that. [ND] Let me play another computer music piece. I was talking about JMSL earlier. This is a piece that uses JMSL and another music technology called JSyn that Phil Burk has created. It delivers CD-quality audio also via a Java interface. This is a piece that was inspired by the loop work that a very good friend of mine, C.W. Vrtacek has been doing. He’s a great guitarist and an interesting composer. [K] We played some pieces of his from the CD Flies in the Face of Logic. We played that whole thing. [ND] Chuck is amazing. He is currently in a trio called Forever Einstein, they put out a number of records on Cuneiform. By the way, a really interesting guy for guys to interview, you should get in touch with Chuck, a very, very cool guy. He’s done a lot of solo records, too, and he kind of inspired me to put out my first solo record by doing his first on a four-track cassette recorder. He’s very influenced by the tape work by people like The Residents, I guess the first Art Bears record had come out right about then, and was very into Eno for years. “The Studio as Instrument” has totally blown open, totally accepted any sound at any time. He’s done a lot of wonderful, wonderful solo records and one of the things he gets a lot of mileage out of is loops. I very much admire the way Chuck uses loops, so I wrote this application, that’s actually on the web, people can perform this in their own browsers. It’s called A loop’s a loop’s a loop’s a… It’s an eight-track tape machine based on a simple paradigm that you walk into a room, you find some tape on the ground, it’s not documented, you make a loop out of it and flip it on. You like it, you keep it; you don’t like it, you toss it. So every time a start a new loop it’ll be a new sound. We listen to an improvisation by Nick Didkovsky [0:50:05–0:55:28]. Live performance by the composer. We listen to Armed Observation by Nick Didkovsky [0:56:19–0:58:40]. Performed by Doctor Nerve. Published on Every Screaming Ear [Cuneiform CD RUNE 88]. [K] We’re back after that piece, that improvisation with your programme together with Phil Burk’s programme? [ND] Yeah, the tools were written by myself (JMSL) and Phil has worked with me on JMSL. JSyn is of course all Phil’s, but the piece itself was written by myself using these tools. [K] We have a question that still hangs over, we started with it and we’re going to leave now by getting back to it: the progress of the string quartet and Doctor Nerve piece. We left right off way back when you were working on it and nested it way down to keep everybody absolutely on the edge of their seats for the past hour. [ND] It’s ready to rock, it’s ready to go! I’m going to be assembling it this week. [ND] Yeah, we had a première in ’97. The version of Sirius String Quartet then was Todd Reynolds, Liz Knowles, Ron Lawrence and Mary Wooten. We had an incredible première, the energy was just fantastic. We’re actually using the second movement, the conducted improv movement of the piece, from a CBC recording of that performance at the Victoriaville musique actuelle festival. I’ve just had a bit of negotiating to do with Radio-Canada and got the licence to release the second movement. The first movement is for string quartet only, that’s recorded in the studio with the current version of Sirius, which is Mary Whitaker, Joyce Hammann, Ron Lawrence and Tomas Ulrich. Actually, it’s amazing, talking about spanning changes, the original group that was going to perform it was the old Sirius with Laura Seaton. She actually co-wrote the grant with me but the band had changed by the time I wrote the piece so that the première was with the group I mentioned. We actually performed it again with the 1997 version of Sirius at The Kitchen. We got a very nice multi-track recording, so it was kind of a coin flip whether we used the second movement from the Kitchen performance or from the Victoriaville performance. But the première vibe was something. [K] As long as it’s right, everything works. [ND] Yeah. So, the first and third movements are recorded in the studio, are mixed and ready for assembly. I’ll be getting the files back this week and then Cuneiforn will be releasing it in the Spring, April or May. […] Hopefully we’ll be performing it in conjunction with the release, if we find the right venue to do that. [K] Let’s go out with something. [ND] I’ll play you this beautiful version of Swallow the Neck of the Guest who Hisses when you Pass, which was originally written for (and performed by) Bang on a Can All-Stars and performed here by Doctor Nerve in studio. It’s part of the suite Amalia’s Secret. Some of the material I’ve been writing for other ensembles has been sneaking its way into Doctor Nerve repertoire. [K] Doctor Nerve’s leader and mentor, and one of our mentors, Nick Didkovsky, thanks so much for being on Kalvos & Damian. [ND] Thanks for having me, total pleasure. We listen to Computer Generated Piece #2 by Nick Didkovsky [1:03:59–1:09:13]. Published on Did Sprinting Die? [Cuneiform CD 55002]. We listen to Swallow by Nick Didkovsky [1:09:52–1:11:40]. Performed by Doctor Nerve. Recording provided by the composer. We listen to Black Iris by Nick Didkovsky [1:13:00–1:30:13]. Performed by Nick Didkovsky, Fred Frith, Mark Howell and René Lussier. Published on Binky Boy [Punos Music CD PM0003]. Dennis Báthory-Kitsz has made more than 970 works for sound sculptures, soloists, electronics, stage shows, orchestras, dancers, interactive multimedia, installations, and performance events. He encouraged the chamber opera rebirth with Plasm Over Ocean (1977) at the World Trade Center; the interactive performance piece Echo (1985) used custom acoustic and electronic instruments; the museum installation In Bocca al Lupo (1991) and outdoor installation Traveler’s Rest (1992) used quasi-intelligent systems he designed; and he was the first American commissioned for Prague’s Mánes Museum, conducting Zonule Glaes II (1999) for string quartet and electronics. Electroacoustic releases include Detritus of Mating (Sistrum), zéyu, quânh & sweeh (Frog Peak), iskajtbrz (UnLimit), The Warbler’s Garden (Capstone), Snare:Wilding (illegal art), krikisque and Future Remembrance (60x60). Dennis co-hosts the award-winning program Kalvos & Damian, co-founded the NonPop International Network, and created the “We Are All Mozart”project.